These quotes about life are all uplifting, positive and inspirational words of wisdom on life. 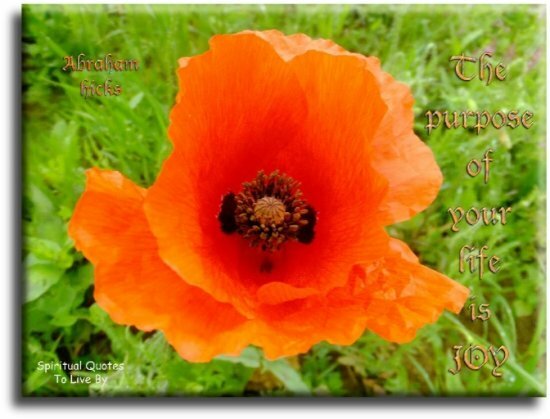 This page also links to many other pages covering different categories, but whether you are looking for wise words for a craft project, encouraging quotes for a friend, or uplifting sayings on aspects of life, ALL of the entries are quotes to live by. 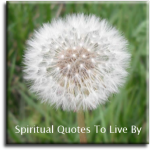 These quotes about life are all positive words of wisdom from sources and authors surnames A & B. The other pages of life quotes are: C & D, E to H, I to L, M & N, O to R, S & T, U to Z, and Unknown Sources. There is also a condensed page of the best life quote and sayings at 100 Inspirational Quotes To Live By. Let me remember I am one with God. Our shining footprints point the way to truth, for God is our Companion as we walk the world a little while. 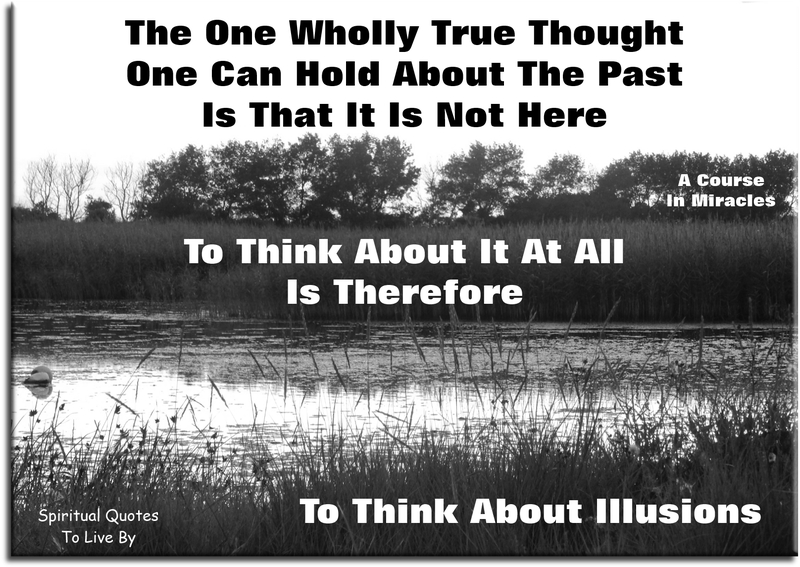 The one wholly true thought one can hold about the past is that it is not here. To think about it at all is therefore to think about illusions. We have three types of friends in life… friends for a reason, friends for a season, and friends for a lifetime. We are all visitors to this time, this place. We are just passing through. Our purpose here is to observe, to learn, to grow, to love.. And then we return home. Everything is unfolding perfectly. And as you relax and find ease in your attitude of trust, knowing that Well-Being is your birth-right, amazing things will happen, things the likes of which you have not seen before. The purpose of your life is Joy. Your life is right now. It's not later. It's not in that time of retirement. It's not when the lover gets here. It's not when you've moved into the new house. It's not when you get the better job. Your life is right now. It will always be right now. You might as well decide to start enjoying your life right now, because it's not ever going to get better than right now... until it gets better right now! Your time is a perceptual thing, and even though the clock is ticking the same for everyone, your alignment affect your perception, as well as the results that you allow. What sunshine is to flowers, smiles are to humanity. They are but trifles, to be sure, but scattered along life's pathway the good they do is inconceivable. Everything I do, in every channel of my life, is part of a legacy that I’m making for my child. For my children, if I have more. I’m not motivated by much, certainly not money - but I’m motivated by that. It’s very easy to give in to being famous, because it’s charming, it’s powerful, it draws you in. Really, it’s harder work resisting it. But after a while I just refused to accept a life that was not real. Even a God cannot change the past. Dreams are free - so free your dreams. There are no random acts. We are all connected. You can no more separate one life from another than you can separate a breeze from the wind. 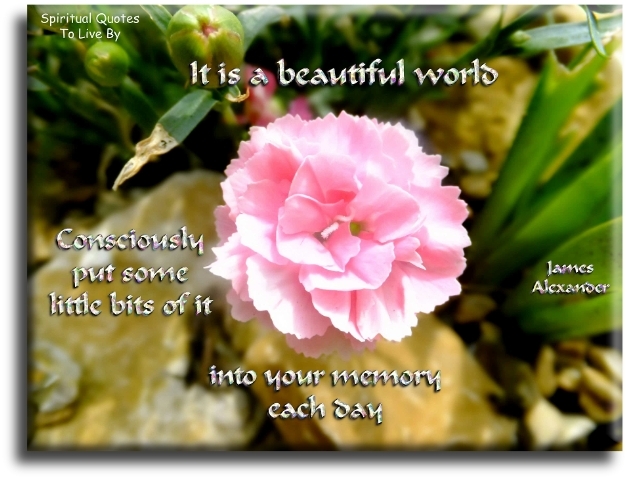 It is a beautiful world... consciously put some little bits of it into your memory each day. 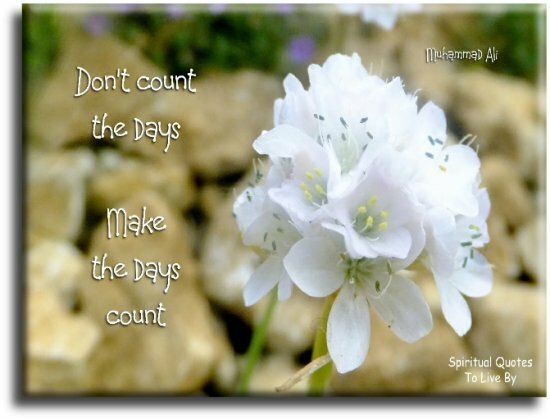 Don't count the days... Make the days count. The bad news is... time flies. The good news is... you're the pilot. The path through life is the highway. 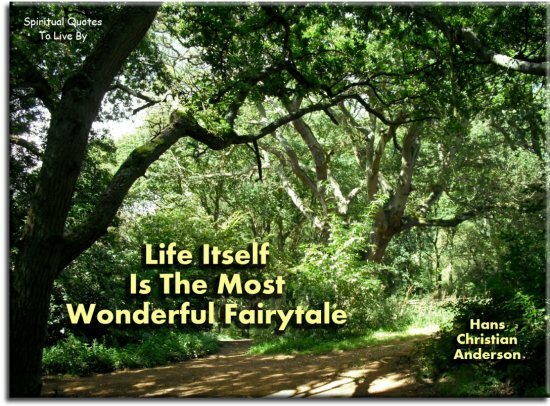 Life itself is the most wonderful fairytale. You may not control the events that happen to you, but you can decide not to be reduced by them. The purpose of art is not a rarified, intellectual, distillate - it is life, intensified, brilliant life. 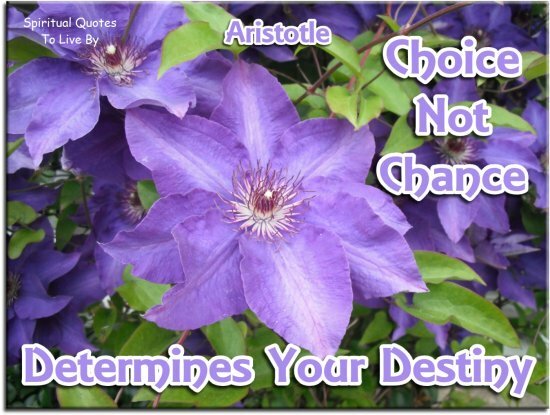 Choice, not chance... determines your destiny. What we play is... Life. Even the sun directs our gaze away from itself and to the life illumined by it. If my doctor told me I had only six minutes to live, I wouldn't brood... I'd type faster. Was there anything more exciting in life than seeking answers? 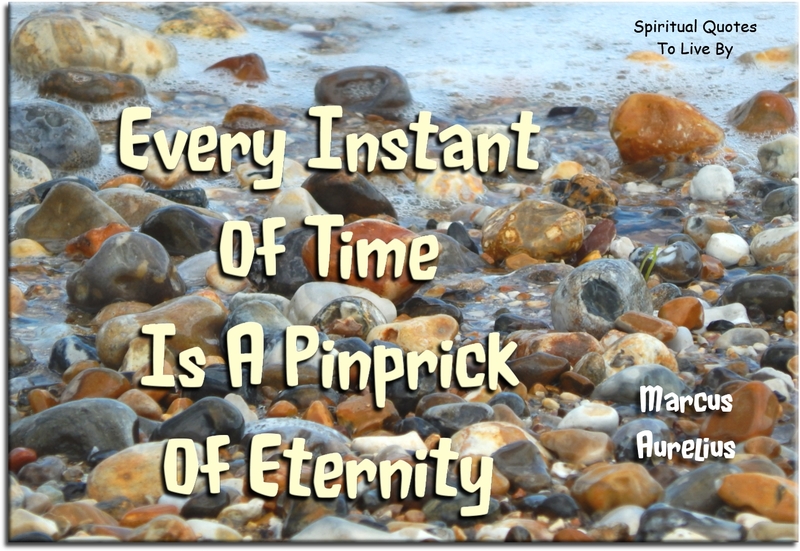 Every instant of time... is a pinprick of eternity. Very little is needed for a happy life. When you arise in the morning, think of what a precious privilege it is to be alive... To breathe ~ To think ~ To Enjoy ~ To Love. The first and the most important thing is to know that life is one and immortal. Only the forms, countless in number, are transient and brittle. The life everlasting is independent of any form but manifests itself in all forms. Life then does not die... but the forms are dissolved. Here is a test to find whether your mission on Earth is finished... If you're alive, it isn't. The life of every person is like a diary in which he means to write one story and writes another. 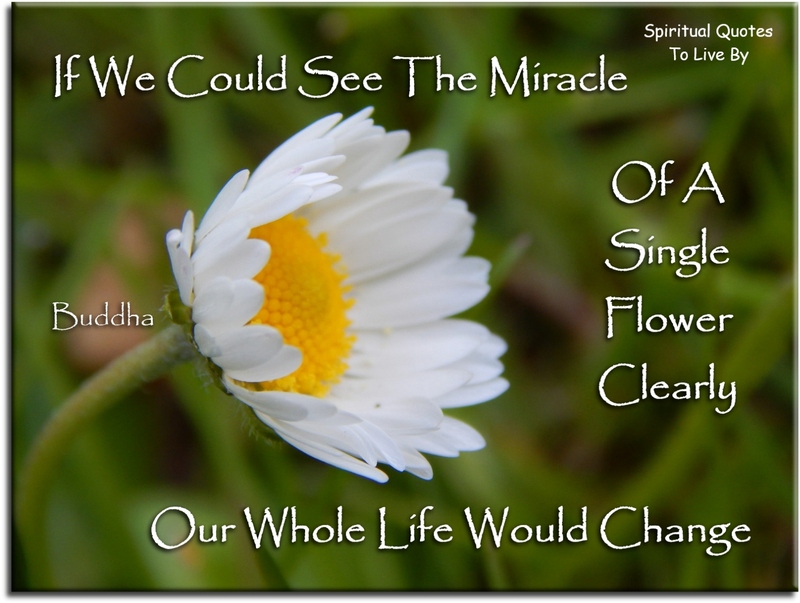 Each day when you wake up, say: "What miracles would you have me perform today?" Then listen. There is no life without consciousness. There is no consciousness without life. For all men have one entrance into life, and the like going out. Train up a child in the way he should go.. And when he is old, he will not depart from it. Behold this day. It is yours to make. Even the seasons form a great circle in their changing, and always come back again to where they were. The life of a person is a circle from childhood to childhood, and so it is in everything where power moves. Birds make their nests in circles, for theirs is the same religion as ours. Your heart is your paintbrush. The entire Universe is your canvas. You life is your art. In each life there comes at least one moment, which, if recognized and seized, transforms the course of that life forever. Rely, therefore, on radical trust, even though the moment may call for you to leap empty-handed into the void. Nothing is predestined. The obstacles of your past can become the gateways that lead to new beginnings. Where you live in the world should not determine whether you live in the world. If you want your life to be different, you have to be willing to do something different first. 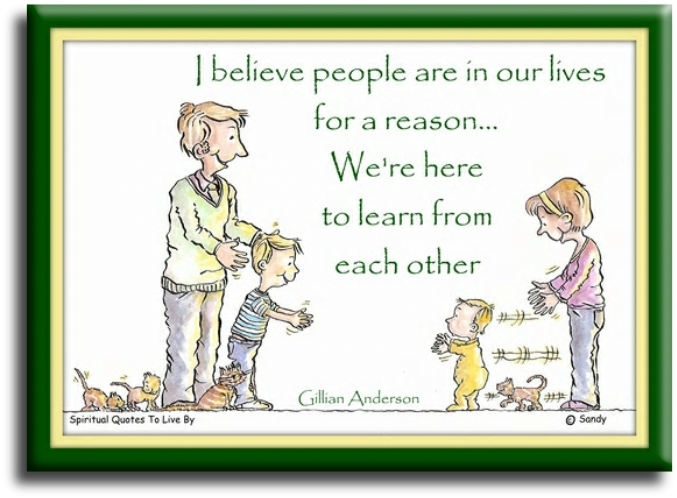 Anything we tell our kids about life is a placemarker until they figure it out for themselves. How often in life we complete a task that was beyond the capability of the person we were when we started it. 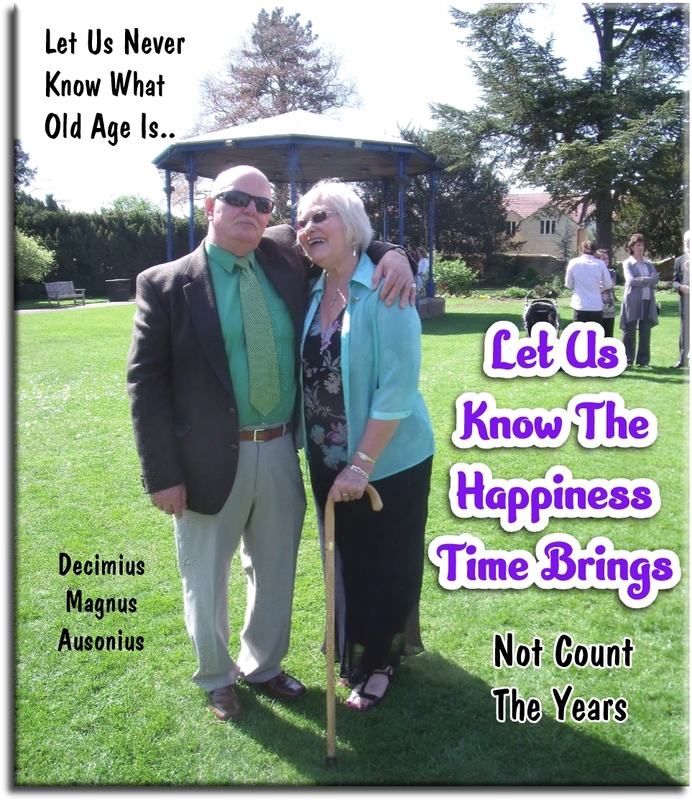 It is possible at any age to discover a lifelong desire... you never knew you had. Life is too short to hold a grudge, also too long. Looking back you realize that a very special person passed briefly through your life... and it was you. It is not too late to find that person again. Looking back you realize that everything would have explained itself, if you had only stopped interrupting. Optimist… someone who isn’t sure whether life is a tragedy or a comedy, but is tickled silly just to be in the play. 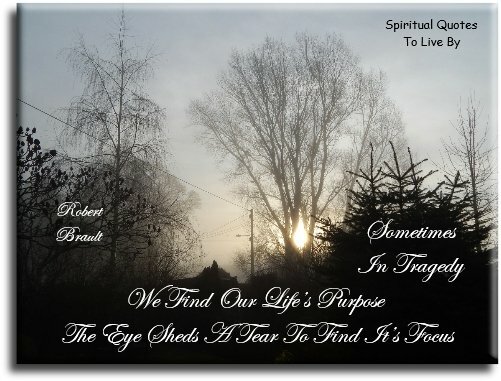 Sometimes in tragedy we find our life's purpose... the eye sheds a tear to find its focus. The best things in life are not only free, but the line is shorter. To accept on faith is the basic requirement for getting on with life. You start making progress in life when you realize that you don’t always have to resume where you left of. Gratitude bestows reverence, allowing us to encounter everyday epiphanies, those transcendent moments of awe that change forever how we experience life and the world. You are the sculptor of your own reality. Don't hand your tools to anyone else. Nothing goes to waste on the journey of life. Both good and bad experiences shape your mind and heart for what is to come. Life has no limitations - except the ones you make. The only limits to the possibilities in your life tomorrow... are the BUTS you use today. 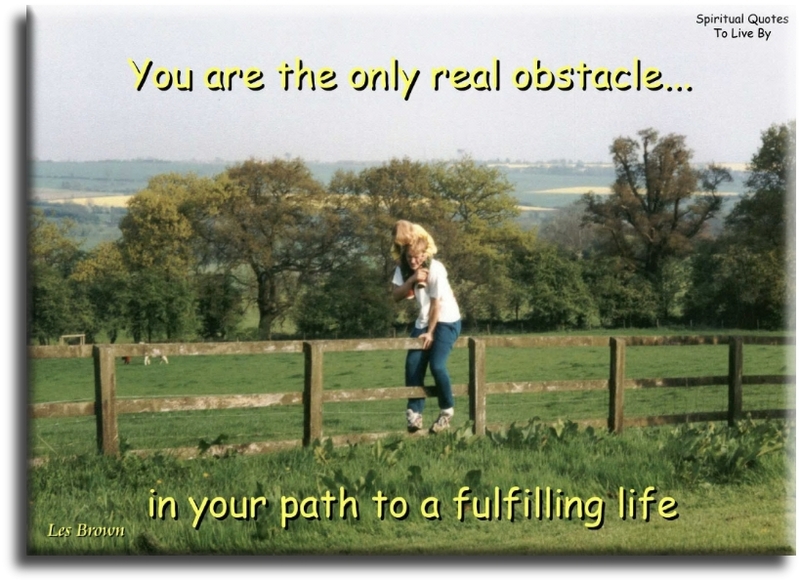 You are the only real obstacle in your path to a fulfilling life. However time or circumstances may come between mother and her child, their lives are interwoven forever. 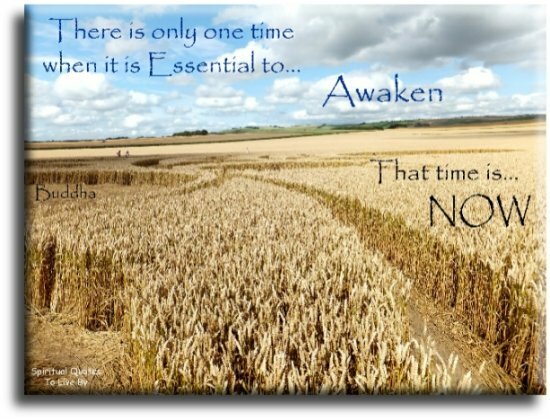 There is only one time when it is essential to Awaken... that time is NOW. Everything’s a story, you are a story, I am a story. Now's the day and now's the hour. Love is life... And if you miss love, you miss life. Being a mother has made my life complete. 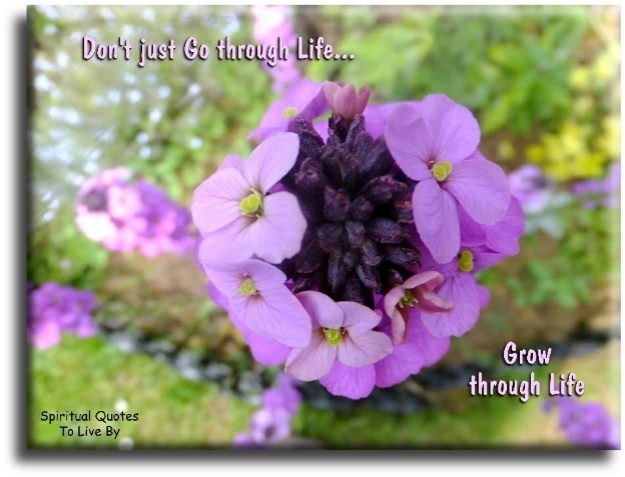 Don't go through life... Grow through life. Most people have never learned that one of the main aims of life is to enjoy it. Children are our future, and the only way for the world to evolve, as I have been shown it should be, is for each generation to be more loving and compassionate than the one before. This is only possible if we support the children around us, and protect and encourage them so that they don’t need to lock their love away. If we could acknowledge to ourselves and to our good friends that we love them, our lives would be more fulfilled and happy. Life doesn't happen to you, you receive everything in your life based on what you've given. Life is so much easier than you think it is, and as you come to understand the way life works, and the power you have inside you, you will experience the magic of life in its fullness. The life of your dreams, everything you would love to be, do or have, has always been closer to you than you knew... because the power to everything you want is inside you. Whatever you give out in life is... what you receive back in life. 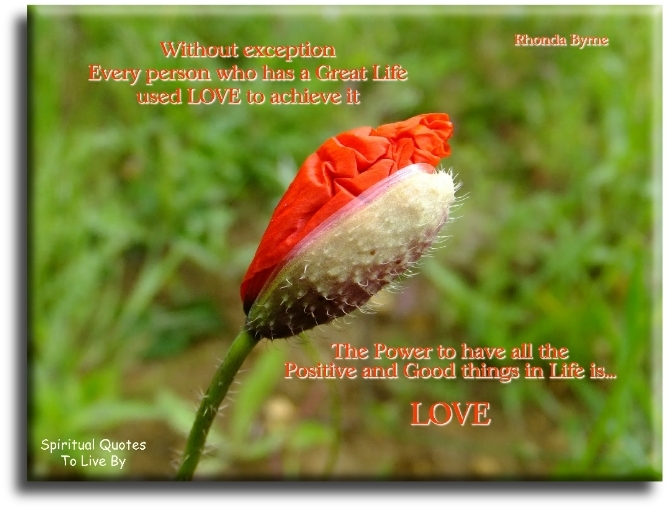 Without exception, every person who has a great life used love to achieve it. The power to have all the positive and good things in life is love. You are creating your life with your thoughts and your feelings. Whatever you think and feel creates everything that happens to you and everything you experience in life. You can change your life, because you have an unlimited ability to think and talk about what you love, and so you have an unlimited ability to bring everything good in life to you. 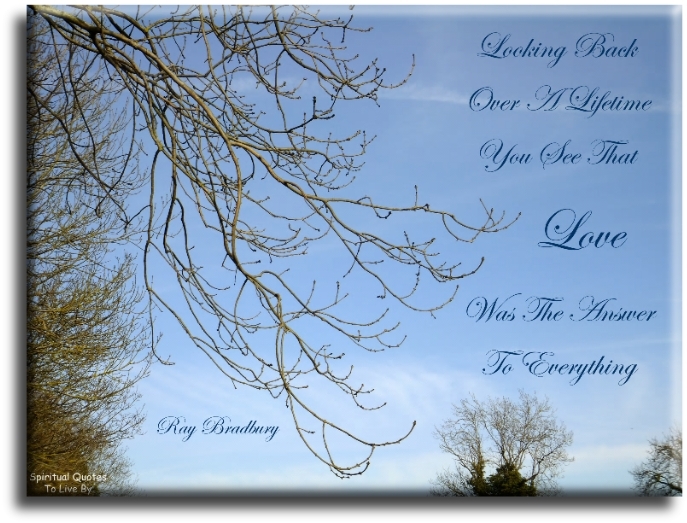 Get daily inspiration and upliftment with these handy quote cards all about life. 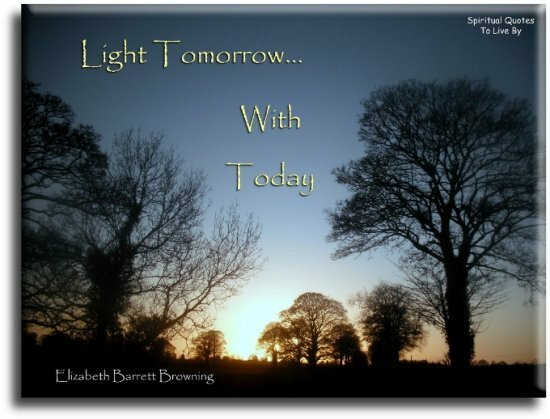 You can read all of the quotes from the cards at the 100 Inspirational Life Quotes page.